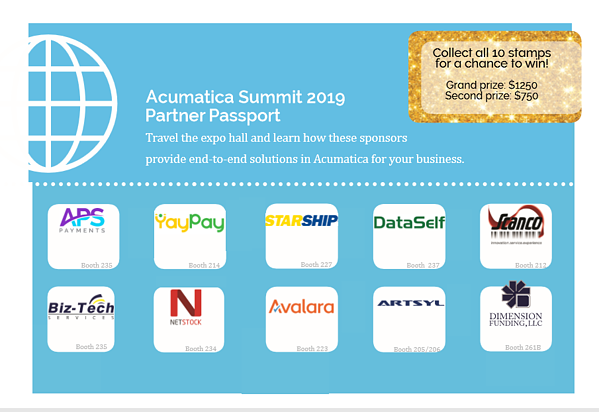 V-Technologies is happy to share we will be exhibiting at Acumatica Summit 2019 in Houston, TX from January 27, 2019 - February 1, 2019. Stop by booth #227 to learn more about our Acumatica shipping software! Acumatica Summit is a wonderful opportunity to network with consultants, hear about the latest releases and learn how tools like our StarShip and ShipGear software can enhance Acumatica. Stop by our booth #227 to see how our shipping software for Acumatica combines parcel, freight and LTL carriers in one user interface. Our bi-directional interface streamlines your entire workflow gaining immediate efficiencies in shipment processing, accounts receivable and customer service. StarShip gives customers instant access to sales orders and shipments and can automatically generate branded shipment notifications, branded labels and all other documentation ultimately resulting in fewer calls to customer service AND driving repeat traffic and sales back to your site. V-Technologies also has partnerships with other supply chain management solutions such as EDI integration with SWK’s MAPADOC and SPS Commerce along with popular barcoding solutions such as Scanco, ScanForce and Panatrack. StarShip also works with Visible Supply Chain Management to offer discounted USPS rates. Additional information about V-Technologies and its solutions are available at www.vtechnologies.coms. Join us for some extra fun, enter to win $1,250 or $750 dollars! Stop by our booth #227 or one of the booths below and get a passport card. Visit all 10 booths below and get a stamp at each location to qualify for a chance to bring home the MONEY! Founded in 1987 and a leading provider of integrated multi-carrier shipping software that connects the warehouse to the front office. StarShip™ and ShipGear® our two flagship products offer shipping software interfaces with Acumatica. StarShip™ shipping software for Acumatica offers a turnkey approach to processing small parcel and LTL shipments. Our interface streamlines your workflow across the organization for improved productivity and cost savings. Acumatica provides cloud-based business management software that enables small and mid-size companies to accelerate their businesses. Built on cloud and mobile technology and a unique customer-centric licensing model. Acumatica delivers a suite of fully integrated business management applications, such as Financials, Distribution, CRM, and Project Accounting, on a robust and flexible platform. For more information, visit Acumatica.